This dish is a light and refreshing crudo/ceviche course served early in the menu. You can do just about anything in the "raw seafood dressed with citrus" framework, so I went to the farmer's market on the day of serving with only the faintest idea of the exact dish I wanted to prepare and letting the market ingredients dictate instead (unlike just about every other course on the menu which is meticulously planned and practiced). 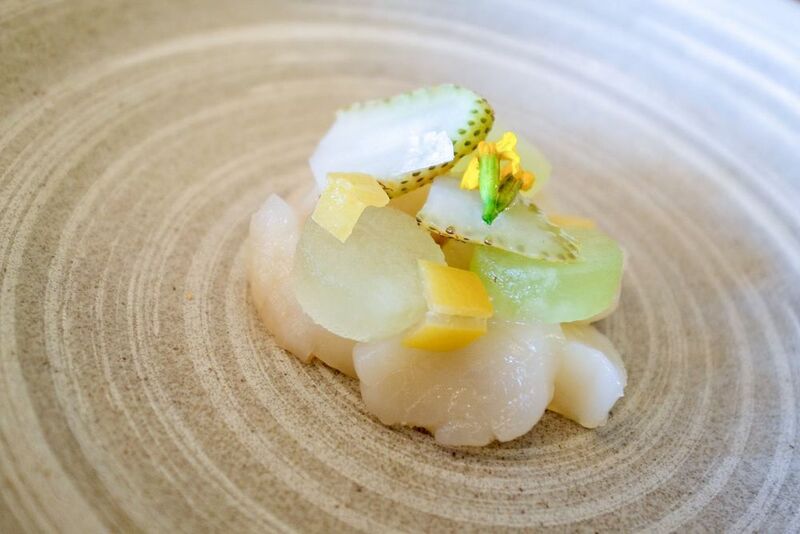 In the end I wanted to showcase really excellent raw scallops paired with something slightly sweet, so I picked up a Galia melon on a whim. Galia is kind of like a hybrid of cantaloupe and honeydew, falling on the sweeter side; it is often served as a dessert. For this dish I compressed the melon in a chamber vacuum sealer which gives the fruit an interesting slightly dense texture and translucent appearance, but you could just as easily omit the compression if you don't have a chamber vac. I used green strawberries in the dish to balance the sweet melon - the underripe berries are more tart and acidic compared to extremely ripe summer strawberries, and they're excellent raw or pickled. A note on raw seafood: "sushi-grade" is an unregulated term and there are no official standards (but certain fish such as salmon must be flash-frozen to kill parasites). You should only eat purchased fish raw if you trust the sourcing and handling of your market or purveyor. For scallops in particular, it is imperative to seek out "dry", or natural scallops. "Wet" scallops have been treated in a sodium tripolyphosphate bath to add water weight and are of inferior quality. Finishing the dish is a few pieces of lemons preserved in salt. Preserved lemons are one of the all-time great condiments with a strong salty lemon flavor - use them sparingly. They're also incredibly easy to make - lemons are sliced, combined with tons of salt and lemon juice, and kept for up to 6 months or more. The flesh is discarded before using; the preparation is all about the peel and pith. It's a great thing to have around. Prepare the preserved lemon (at least 1 month and up to 6 months in advance): Cut two slices in the shape of an "X" down the length of the lemons, stopping about a half an inch from the bottom. Spoon about 1-2 Tbsp of salt into each lemon, making sure to disperse it well across the flesh. Add each lemon to the jar, packing very tightly; squeezing out juice is totally fine. Add another spoonful or so of salt. Add more lemon juice (or water) until the fruit is fully submerged; it's important that the fruit is always submerged and not exposed to air. Seal the jar and leave in a cool dark place at room temperature for 30 days, shaking occasionally and adding lemon juice or water if necessary to keep the fruit fully submerged. After 30 days, transfer the jar to the refrigerator and keep for up to 6 months (or more; use your good judgment). To use, remove the flesh with a sharp knife and slice or dice the peel as desired. Prepare the compressed Galia melon: halve the melon and remove the seeds. Slice the halves crosswise into disks. Vacuum pack the melon slices in a chamber vacuum sealer to compress the flesh (do not pull an excessively long vacuum or the texture will be unappealing). Chill until needed. To serve: use a small ring mold to punch out circular pieces of the compressed melon. Remove the flesh from a preserved lemon and dice the peel. Slice the scallops into two or three slices depending on size. Place a circular ring mold on a serving plate. Arrange the slices of scallop in the ring mold. Top with a few pieces of compressed melon, green strawberry slices, preserved lemon, lime juice, flowers or microgreens, and a few grains of Maldon salt.